If you’ve tried to drive in the Dakotas or fly on the East Coast of the United States, you know just how bad the weather is out there. There’s snow everywhere, and I mean that literally. 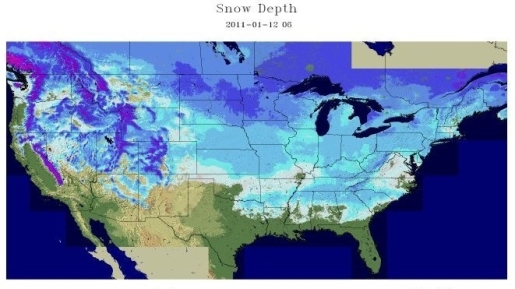 In 49 of the 50 US states, there is snow cover on the ground. The only state to miss out on the winter wonderland is Florida, and that’s just because the southern snow storms made it only to the state’s border and no farther down. There’s snow on the ground in every US state, from sea to shining sea, and even on the big island of Hawaii. According to the National Weather Service, the snow belt even hits paradise: “This includes Hawaii where about seven inches of snow is atop Mauna Kea.” Mauna Kea is Hawaii’s highest peak, standing an impressive 13,796 feet above sea level. Bundle up out there; judging by the 10-day forecast, the snow is far from over here in the US.